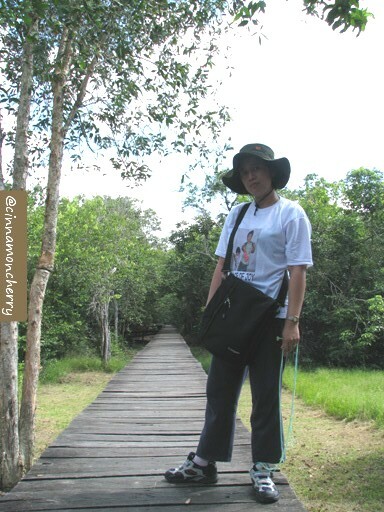 This is yours truly, posing in front of the walkway made of ulin a.k.a. ironwood. I was amazed to know that the walkway was built by volunteers, circa 2002-2003. Ironwood is known for its strength and durability. And it takes many, many years for them to grow. Items made of ironwood might last up to 50 years, and more. 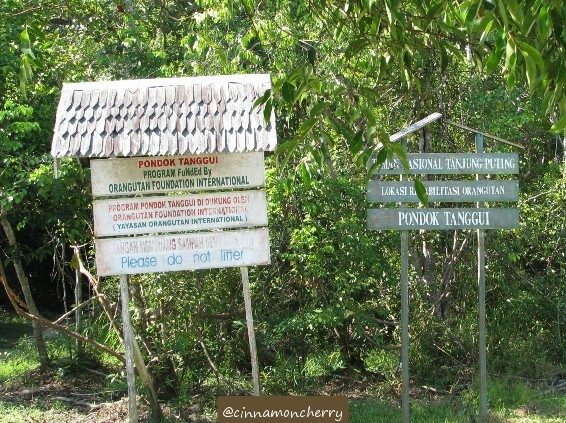 Pondok Tanggui has a relatively short trek route to the feeding site. IIRC it takes about 15 minutes or so. The guide told me it was about 1 kilometer. There is a longer trekking route, around 22 kilometers, but only experienced trekkers (plus a local guide) are advised to try this one. It will take about a full day and some parts of the route are filled with water. This route will lead to Pesalat and then Tanjung Harapan. We arrived just on time! 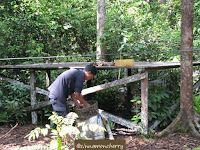 The rangers were preparing some bananas for the orangutans. Since we managed to see Yani yesterday in Pondok Tanggui, we were kind of hoping that we'd be able to meet Doyok, the king of orangutan in this area. We were advised to stay silent while observing the orangutans. I noticed that some squirrels were already hopping on the platform, seeking to steal some food before orangutans' arrival. 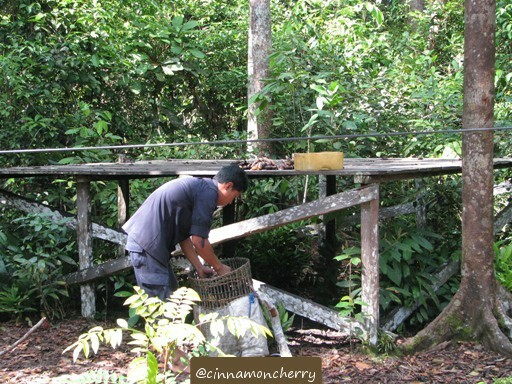 We noticed few female orangutans arrived and began to collect the bananas. No sign of Doyok yet. 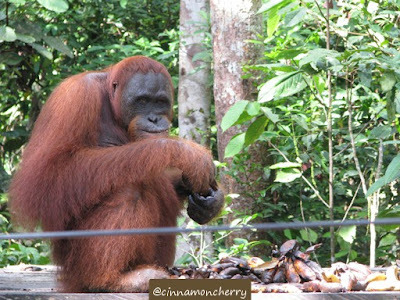 Kopral, a young male orangutan, came to the site and munched plenty of bananas. He was looking back and forth, afraid that the king would come and shoo him away. He was too young to develop any cheekpads, but maybe one day, if he becomes more aggressive. 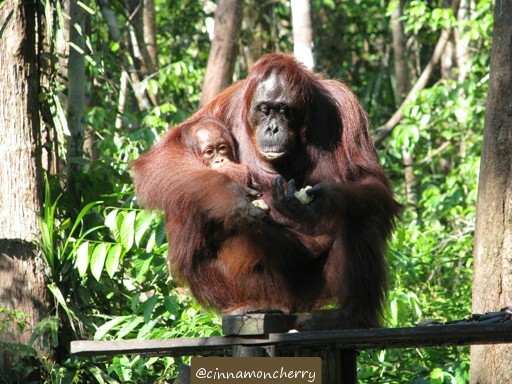 Some females carry their young ones with them. Here you can see one of them feeding on bananas with her child. To me, this is an "awww" moment. Unfortunately after waiting for a while, it was apparent that Doyok wouldn't come. Ah, well. Maybe he was busy somewhere else. 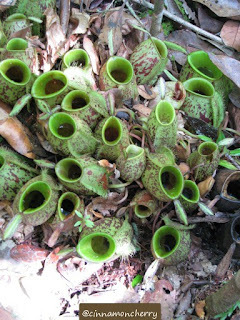 During our short trek back, the guide, Mr. Yusup, showed us tropical pitcher plants (kantong semar). 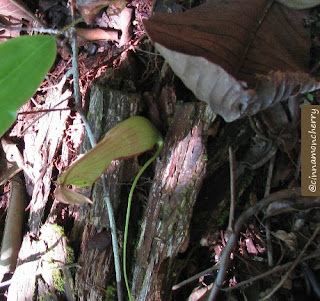 These plants are rare and believed to have medicinal qualities. 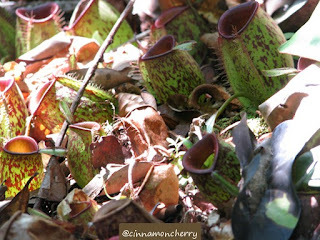 I only saw three from the seven species available in Pondok Tanggui area. 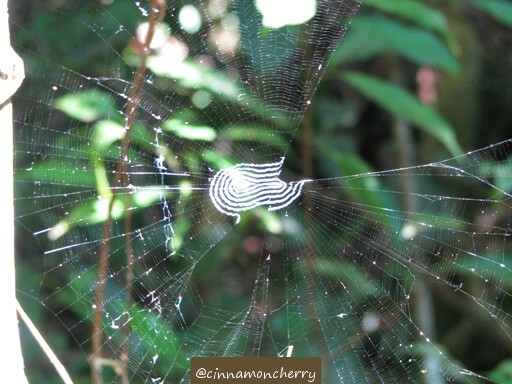 Mr. Yusup also made me aware of this, the beauty of a spiderweb. Ah, too bad we did not have all day to explore. There are so many interesting plants and animals here!